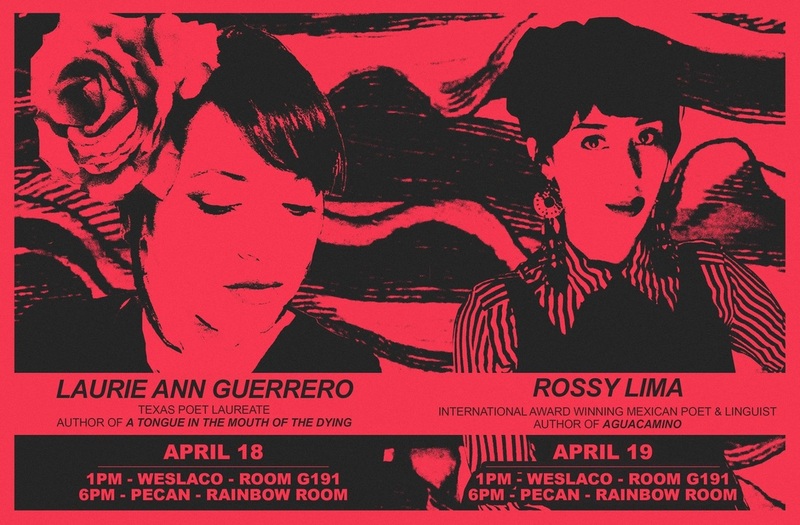 South Texas College will be featuring Texas Poet Laureate Laurie Ann Guerrero and International Award Winning Poet and Linguist Rossy Evelin Lima during National Poetry Month on April 18th and 19th. Make sure to mark your calendars, for these are two must-see presentations if you are anywhere near South Texas. It is worth mentioning that these two major Latina poets who are known for their constant rise in the national and international literary scene will be presenting their work back-to-back in a poetic celebration to be remembered. Laurie Ann will be presenting on April 18th at the Weslaco Campus in room G191 at 1PM and then transferred to the McAllen Pecan Campus in the Rainbow Room at 6PM. Rossy will appear on April 19th at the Weslaco Campus in room G191 at 1PM and then transferred to the McAllen Pecan Campus in the Rainbow Room at 6PM. Guerrero is the Texas Poet Laureate and is an award-winning author. Her poetry and critical works have appeared in various journals and magazines. She is a CantoMundo fellow and was featured at TEDxSanAntonio in 2014. ​Guerrero has written the collection A Crown for Gumecindo and A Tongue in the Mouth of the Dying, which won the Andrés Montoya Poetry Prize. Her chapbook, Babies Under the Skin also won the Panhandler Publishing Award and she is also the recipient of the International Latino Book Award. Click here to visit the poet's official website. Lima is an international award-winning Mexican poet and linguist. She has been published in numerous magazines, journals and anthologies in Spain, Italy, Canada, United States, Mexico, Venezuela, Chile and Argentina. Her poetry has been translated to Portuguese and Italian. Lima is the recipient of the National Gabriela Mistral Award by the National Hispanic honor society in the U.S and the Premio Internazionale di Poesia Altino in Italy. She was also a featured poet in the Smithsonian Latino Virtual Museum and was invited to speak at TEDxMcAllen about her experience as an immigrant writer in the U.S in 2015.